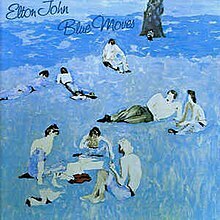 Blue Moves is the eleventh studio album release by Elton John. It was released in October 1976. It was John's second double album (after Goodbye Yellow Brick Road) and the first to be released by his own label, Rocket Records Ltd. Despite the album's darker tone, it reached no. 3 on the charts. Having completed what he described as a "gruelling American tour", John only gave a handful of performances at the time of release, and later announced (during a charity concert at Wembley Arena the following year), "I haven't been touring for a long time. It's been a painful decision, whether to come back on the road or not... I've made a decision tonight – this is going to be the last show... There's a lot more to me than playing on the road." He accordingly left the touring/live performing scene for a brief period, whilst Kenny Passarelli, Caleb Quaye, James Newton-Howard and Roger Pope left the band after the album's release. Newton-Howard would briefly rejoin John's touring band in 1980. Only Davey Johnstone and Ray Cooper returned in limited roles for John's next album, A Single Man. John has stated that Blue Moves is one of his favourites of the albums he has recorded. It was the last album Gus Dudgeon produced with John for almost a decade. The cover art is from a painting by British artist Patrick Procktor, called "The Guardian Readers". In the U.S., it was certified gold in October and platinum in December 1976 by the RIAA. "Cage the Songbird" was a tribute to legendary French songstress Edith Piaf, and a year or so later was covered by Kiki Dee on an unreleased Rocket album, which finally was issued in 2008. ("Songbird" originated as part of the Rock of the Westies sessions, but was not completed during them, probably because the song's acoustic, delicate sound did not fit with the more rock 'n' roll approach of the rest of the songs that made the Westies final track list.) The Beach Boys turned down "Chameleon" (which was written two years prior to the album's release), but Bruce Johnston, a former Beach Boy, performed backing vocals on John's version along with Toni Tennille. John also performed the song at Wembley Stadium in 1975, where he also performed the Captain Fantastic and the Brown Dirt Cowboy album in its entirety. An excerpt from "Out of the Blue" was used for the closing titles on Top Gear until the end of that Top Gear format (in 2001). This was one of two albums in which Davey Johnstone does not provide backing vocals; 1997's The Big Picture would be the other. Blue Moves was initially recorded in Toronto, Ontario. John has played several songs from Blue Moves live: "Sorry Seems to Be the Hardest Word", "Bite Your Lip", "One Horse Town", "Tonight", "Idol" and "Crazy Water" have been played during various concert appearances through the years. Blue Moves has received negative reviews since its release. A contemporary review for Rolling Stone said the album "contains nowhere near enough good songs to justify the extended length" and that the interludes and instrumentals were done "to the exclusion of sense." Village Voice critic Robert Christgau described it as "impossibly weepy" and "excessive". Lindsay Planer of Allmusic later said the album showed the "inevitable fatigue" of John's "immense creativity" that had helped create his previous albums of his career. Initial CD versions of the album maintain the same running order, but omit the following tracks: "Shoulder Holster", "The Wide-Eyed and Laughing", "Out of the Blue", and "Where's the Shoorah?" It has since been remastered and re-released as a 2-CD set retaining the original LP track listing. Track numbering refers to the 2-CD and digital releases of the album. Engineers – Arun Chakraverty, Gus Dudgeon, Mark Howlett, John Kurlander, Earle Mankey and John Stewart. ^ "Blue Moves". albumlinernotes. Retrieved 6 March 2019. ^ Elton John: Live in Australia with the Melbourne Symphony Orchestra, 1987. ^ a b Planer, Lindsay. "Blue Moves – Elton John". AllMusic. Retrieved 7 February 2012. ^ a b Christgau, Robert (1981). "Consumer Guide '70s: J". Christgau's Record Guide: Rock Albums of the Seventies. Ticknor & Fields. ISBN 089919026X. Retrieved 27 February 2019 – via robertchristgau.com. ^ a b "Blue Moves Album Review". Rolling Stone. Retrieved 1 August 2015. ^ "Elton John - Blue Moves (album review)". Sputnikmusic. Retrieved 6 March 2019. ^ "Canadian album certifications – Elton John – Blue Moves". Music Canada. ^ "French album certifications – Elton John – Blue Moves" (in French). InfoDisc. Select ELTON JOHN and click OK.
^ "British album certifications – Elton John – Blue Moves". British Phonographic Industry. Select albums in the Format field. Select Gold in the Certification field. Type Blue Moves in the "Search BPI Awards" field and then press Enter. ^ "American album certifications – Elton John – Blue Moves". Recording Industry Association of America. If necessary, click Advanced, then click Format, then select Album, then click SEARCH. ^ "danskehitlister.dk". danskehitlister.dk. Retrieved 6 March 2019. ^ "dutchcharts.nl Elton John – Blue Moves" (ASP). Hung Medien (in Dutch). MegaCharts. Retrieved 29 February 2012. ^ "InfoDisc : Tous les Albums classés par Artiste > Choisir Un Artiste Dans la Liste : Elton John" (in French). infodisc.fr. Archived from the original (PHP) on 10 September 2013. Retrieved 29 February 2012. ^ a b "Hit Parade Italia – Gli album più venduti del 1977" (in Italian). hitparadeitalia.it. Retrieved 29 February 2012. ^ "charts.org.nz Elton John – Blue Moves" (ASP). Hung Medien. Recording Industry Association of New Zealand. Retrieved 29 February 2012. ^ "norwegiancharts.com Elton John – Blue Moves" (ASP). Hung Medien. VG-lista. Retrieved 28 February 2012. ^ "swedishcharts.com Elton John – Blue Moves" (ASP). Sverigetopplistan. Retrieved 29 February 2012. ^ "Chart Stats – Elton John – Blue Moves" (PHP). UK Albums Chart. Retrieved 28 February 2012. ^ "allmusic ((( Blue Moves > Charts & Awards > Billboard Albums )))". allmusic.com. Retrieved 28 February 2012. ^ "Album Search: Elton John – Blue Moves" (ASP) (in German). Media Control. Retrieved 28 February 2012. ^ "Dutch charts jaaroverzichten 1977". Dutchcharts.nl. Retrieved 2 April 2014. ^ "RPM Top 100 Albums of 1977". RPM. 31 December 1977. Retrieved 24 February 2012. ^ "Top Pop Albums of 1977". billboard.biz. Retrieved 12 August 2011.